If you are searching for solar panel costs, reviews, incentives or rebates in Arizona, Alternative Energy, LLC can help! We offer solar panel installation in many areas of Arizona including Phoenix, Scottsdale, Mesa, Tempe, Ajo, Chandler and more. Contact us today for a free solar panel installation quote. We offer NO MONEY DOWN solar panel installation in all areas of Arizona! We also help you find all of the solar tax credits, rebates and incentives to cover most of the cost of installation within the first couple of years. We offer affordable residential and commercial solar panel installation. See how much money you can save after installing your residential solar panels by giving Alternative Energy, LLC a call today! Common queries used to find this page include: “solar panels Arizona cost”, “solar panels Arizona reviews”, “Arizona Solar Power Incentive” or “Arizona Solar Tax Credit”. Take advantage of the many hours of sunlight Arizona produces every year. Residential solar panels are worth the investment if you want to lower your electric bill and carbon footprint. Arizona ranks #8 in the United States for electricity savings from solar panels. The average home in Arizona consumes about 1,061 kWh of electricity per month. That means the average homeowner needs about a 6 kilowatt solar system to cover their electricity consumption. Installing a solar system for your home can offset up to 99% of your electricity consumption but every situation varies. The average payback time is about 7 years. The cost of electricity is predicted to rise up to 32¢ over the next 25 years. Lock in low electricity rates at 6¢/kWh by installing solar panels. According to the EIA, the price of residential electricity is $12.5/kWh, which is lower than the average national residential cost of $12.90/kWh. Only 9% of Arizona’s electricity is created by renewable resources, join in the fight to main Arizona the #1 solar state. Arizona currently ranks #3 for “best states for residential solar energy” says NerdWallet. How Much Do Solar Panels In Arizona Cost? 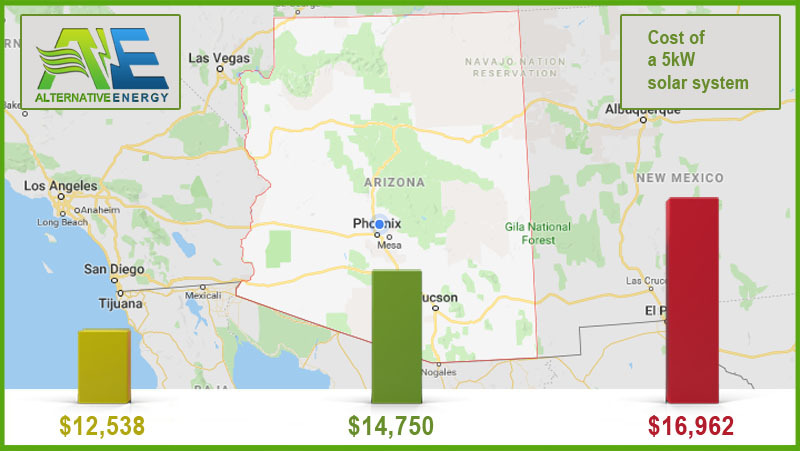 The average cost of a 6kW solar system in Arizona is about $18,100 before Arizona solar rebates and incentives. After solar tax credits and rebates you are looking at paying a net cost of $13,838. The average cost of a 7kW solar system is about $24,500. Yes, solar panels are absolutely worth it in Arizona. Arizona has some of the best solar tax credits, incentives and rebates in the United States. Solar panel installation is affordable and your can save over $50,000 – $100,000 over the lifetime of your system. According to NerdWallet, Arizona ranks in the top 5 for “Sunniest Cities in The US” with Yuma, Arizona ranking #1, Phoenix, Arizona ranking #4 and Tuscon, Arizona ranking #5. With so many sunny days, you can understand why solar can be so beneficial in Arizona. ARE SOLAR PANELS WORTH IT ARIZONA? The Residential Arizona Solar Tax Credit gives you back 25% of the cost of your solar panel installation, up to $1,000, off of your income tax return in the first year you install the system, according to EnergySage. Read more about the Residential Solar and Wind Energy Systems Tax Credit here. The Solar Investment Tax Credit or (ITC) will help you save another 30% off your solar panel installation and can be deducted from your federal income tax return. This credit can only be used by customers who choose cash pay solar or a solar loan and have enough income for the credit to make since. Read more about Solar investment tax credit. Get a free solar panel installation estimate anywhere in Arizona by contacting Alternative Energy, LLC today. We offer many solar financing options to make your solar installation easy.